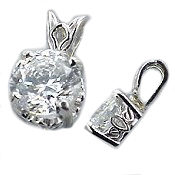 Stock #PL1898:Platinum Basket Pendant Blank... Antique/Scroll 4 prong heavy-weight pendant.Ready to set for your Diamond or we will set with one of our Top Quality Russian Cubic Zirconia. Matching Earrings and Wedding set available. Also available in 14k White Gold or 14k Yellow Gold. *** Sorry this item is no longer available!